VNA, the association of Dutch vehicle leasing companies, was founded in 1983. It has since grown into a professional association which lease and manage fleets of about 637,500 passenger and light commercial vehicles (representing some 90% of the Dutch vehicle leasing industry). As such, VNA is the representative of corporate car use. VNA is an active member of the Confederation of Netherlands Industries and Employers (VNO-NCW) and the European umbrella organisation Leaseurope. VNA represents its members in many different organisations, ministries and other government bodies. As such, it participates in the early stages of drawing up policies and regulations that may affect the vehicle leasing industry in the future. VNA also works with other vehicle industry organisations such as BOVAG, the RAI Association, Evofenedex, Vereniging Zakelijke Rijders, ANWB, etc. VNA members can count on the support of their industry association for such things as advisory services, general information as well as answers to issues of a more legal, fiscal and technical nature. Finally, VNA is the platform for the entire vehicle leasing industry, a place where members can meet, discuss current developments and capitalise on that where possible. VNA is a member of Leaseurope, the European Federation of Leasing Company Associations. Leaseurope brings together 46 member associations in 34 European countries representing the leasing, long term and/or short term automotive rental industries. In 2013, these associations represented more than 1,350 leasing firms and over 500 short term rental companies. The scope of products covered by Leaseurope members’ ranges from hire purchase to finance and operating leases of all asset types (automotive, equipment and real estate) and also includes the rental of cars, vans and trucks. 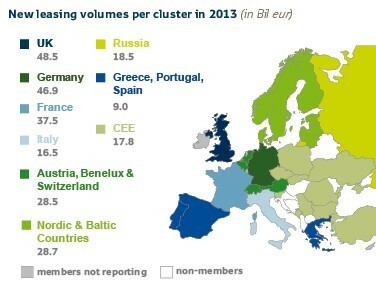 It is estimated that Leaseurope represented approximately 92% of the European leasing market in 2013.